First . . . student commencement speaker at Wellesley First . . . woman to become full partner at Rose Law Firm First . . . Lady of the United States First . . . First Lady to hold a postgraduate degree First . . . First Lady to win a Grammy Award First . . . elected female Senator of New York First . . . woman to be a presidential candidate in every primary in every state First . . . First Lady to seek the presidency "Always aim high, work hard, and care deeply about what you believe in. . . . And, when you're knocked down, get right back up and never listen to anyone who says you can't or shouldn't go on." 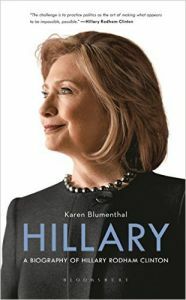 -Hillary Rodham Clinton As a young girl growing up in the fifties, Hillary Diane Rodham had an unusual upbringing for the time-her parents told her, "You can do or be whatever you choose, as long as you're willing to work for it." Hillary took those words and ran. Whether it was campaigning at the age of thirteen in the 1964 presidential election, receiving a standing ovation and being featured in LIFE magazine as the first student commencement speaker at Wellesley, or graduating from Yale Law School-she was always one to stand out from the pack. And that was only the beginning. From First Lady of the United States to the first female Senator of New York and most recently as the United States Secretary of State. An activist all her life, she has been devoted to health care reform, child care, and women's rights, among others.